Composition: Spun-dyed Polyester HT and UV protection. Features: endless buckle. Recommended use: for small loads and DIY. Composition: Spun-dyed Polyester HT and UV protection. Features: endless lashing or with closed hook. Recommended use: for small loads and DIY. Composition: Spun-dyed Polyester HT and UV protection. Features: endless lashina or with closed hook. The stainless steel of the turnbuckle and or the closed hook gives a high corrosion resistance. Recommended use: for small loads and DIY. Corrosion resistant hooks and ratchetTriple overstitched for added securitySupplied singly - polybag with header cards. Made to BS5759. Quick Release Sail Straps - 25mm webbing. Quick Release and bungee cord. Set of 2. ... strength polyester webbing for securing cars and vans onboard ferries and RoRo vessels. Certificates are supplied with all lashings delivered. 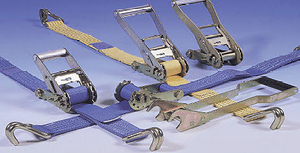 Web lashing straps are used to immobilize bailed or palletized cargo, or vehicles. These devices are used on all types of vessel for secure cargo stowage. They are particularly common on Ro-Ro ships. The lashing has hooks at each end. One end is attached to the cargo, the other to an anchoring point or other fixed structure on the vessel. The device includes a tensioning mechanism that is tightened until the cargo cannot move. Choice will depend on the size of the strap, the characteristics of the hooks and of the tensioning device, and the breaking load of the device.